Need Clean? Get Your Free Estimate Today! Schedule Your Free Estimate Today! A detailed estimate can be delivered to your inbox in as little as 10 minutes. No hassles or obligations. Just great service! All services are individually priced on your proposal allowing you to easily compare pricing and choose services that best fit your individual needs. Like To Share Some Details? A Window Guy will be in touch shortly. Thanks! Get your detailed free-estimate delivered right to your email as little as ten minutes. The Window Guys provide a friendly and professional exterior cleaning service that is sure to impress. The Window Guys specialize in providing a service that not only makes your home look better but FEEL better. The feeling one experiences after having their windows professionally cleaned for the first time is truly inexplicable. The brilliant shine, the mirror-like reflection, the flood of natural light. All of these elements contribute to the awe-like effect one experiences when gazing though what was previously described as a window. But now, your windows are most than just that. They are a breath of fresh air, a reflection of the newfound confidence, contentment, and relief. The Window Guys were founded in 2014 with the mission of providing clarity for homeowners across Georgia. Founder, Chris Belflower, sought to provide this clarity by creating an fun and fresh alternative to the seemingly laborious and tedious task of cleaning your homes windows. Just kidding, I actually avoid looking at them altogether. Routine window cleaning is important for many reasons, most of which are overlooked, just as the cleanliness of your windows are. Window cleaning, just as pressure washing and gutter cleaning, is a primary preventative maintenance service that should be done at least once a year, often times more often depending on tree coverage and climate. Prevent Hardwater Staining: Do your windows have the beginning stages or perhaps advanced water stains? It may be hard to tell if your windows are really dirty. Hard water stains form when mineral deposits start to accumulate and stick to the surface of your windows. These minerals come from rain, sprinklers, dust, landscaping, etc. Over time these mineral deposits "dig" into the surface of your glass. Once this occurs, the deposit becomes a stain as the minerals permanently etch the surface of the glass. If the stains are left untreated, a restoration service is required which can often be more expensive than a brand new window. Routine cleaning removes these minerals and preserves the integrity of your window. Prolong Life of Your Windows: Aside from eliminating hard water build-up, routine window cleaning prolong the life of your windows by preserving the integrity of your windows sills, frames, and tracks. By keeping these surfaces clear of dirt and grime, the sills and tracks remain it good working condition as opposed to the breakdown that occurs when dirt gets into the nooks and crannies of your windows. Clean tracks keep your windows properly opening and closing. Clean seals ensure that the insulating gases in your windows remain inside keeping your home cooler in the summer and warmer in the winter. Besides, no one likes a a foggy window! Allow More Natural Light Into Your Home: Clean windows equals pristine, clear views allowing more light in, making your home look and feel better. After all, natural light makes your home feel more inviting and actually makes you feel better! Imagine how dreary you would feel if you lived in a cave. Sure, thats a little extreme, but you get the point. Bonus: Increase Curb Appeal & Feel Good About Your Home! Should We Get Your Free Estimate Set-up? No, thanks. I like my dirty windows. Below you will find a brief description of our main services. We perform all of these year around and can pair them or routinely schedule them to meet your homes indivudual needs. Our gutter cleaning services are designed to clean your gutters safely without damaging your home. Gutters & Downspouts are properly cleared of debris allowing for water to properly flow through, diverting away from your homes foundation. Also, we employ ladder stand-off devices, increasing ladder safely and ensuring ladders do not damage or bend your gutters. Window Cleaning, our flagship service can be tailored to meet your needs. We can clean interior, exterior, or combination of both, deep cleaning of sills & frames, as well as post-construction clean up, hard water restoration, or routine cleaning services. 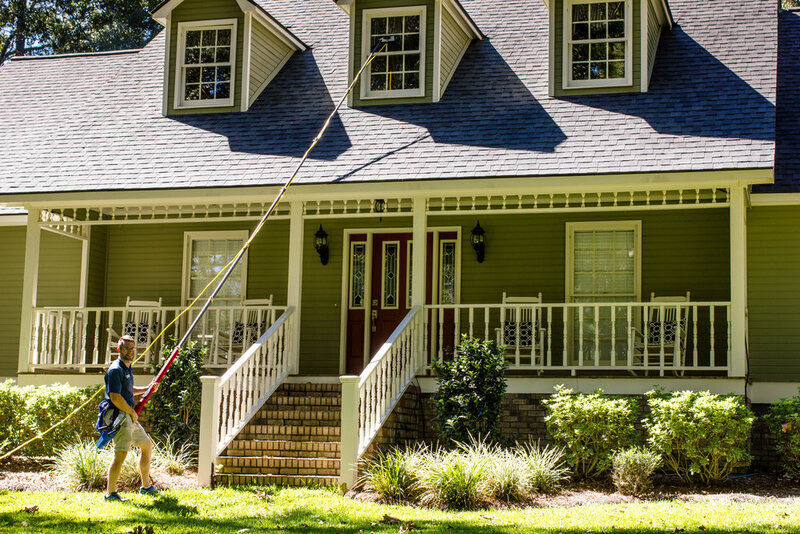 We employ a variety of techniques including traditional cleaning techniques and the use of the Water Fed Pole, the most efficient and safest method of professionally cleaning windows. Although many grimace at the thought of high pressure on your home, we actually take a low pressure spray and rinse approach. This technique is the professional standard of pressure washing and allows the use of biodegradable and eco-friendly detergents to gently break down dirt and build up. This grime is then gently rinsed away with low pressure systems. We also provide surface cleaning for your pool decks, patios, driveways, and sidewalks! Take pride in your work and the rest falls into place. Wow! What can we say?! We have had so many AMAZING customers over the years! Luckily, a few of them have been kind enough to share their experience with you! You may read the actual reviews on our Facebook and Google Review pages. Ready for Your 5-Star Service? Karate Clean My Dirty Windows! Don't worry we won't be karate chopping any of your windows... just cleaning them! Thank you! The Window Guys will be in touch shortly. Sign up and receive our monthly newsletter that includes tutorials on how to keep your own windows cleaned, reminders, and more. We respect your privacy and will never share this information with any other party. Stay tuned for news from The Window Guys!